Listen to the perfectly imperfect Audio Article narrated by yours truly! I was recently having a nice little chat with someone very close to me who was struggling to make a very important decision. She was talking herself in circles and was feeling downright defeated about the whole thing...even though it was a truly exciting opportunity to be looking forward to! She expressed that the choice came down to a choice between comfort and fear. On on hand, she could choose a safe, comfortable option that would be pretty good in the long run and would be easier to transition to. On the other hand, she could choose an option filled with unknown but also filled with opportunity and potential for the future. We talked out the options for awhile and I shared with her that sometimes, fear is excitement in disguise. Sometimes the new and exciting opportunities are exactly what we need, despite the dreadful feelings of unknown and fear that seem to subdue the excitement. "What feels the best deep down in your core?" "How does each choice make you feel when you pretend you have already chosen?" "Take everyone else out of the equation, what do YOU choose alone"
"What does your subconscious mind decide without your conscious mind having a say?" "Have there been any signs in the last few weeks one way or the other?" This got me thinking quite a bit about the big, important decisions I have made in my life and how much fear was attached to them. But as hindsight is 20/20, I can now see that that fear was truly just excitement and that the decisions I made by listening to my heart of hearts are the ones I am still most content with today. I also thought about some of the less important, but eye-opening decisions I had made when I didn't listen to my gut, when I chose money over logic or decided opposite to my deep down truthful feelings. And how much I have come to regret them. But the truth is, learning to listen to your wisdom, trust your truth, and go with your gut is sometimes not easy in the realities of life. Most of the time, it seems much easier to use logic or reason to make decisions, and to ignore that uncomfortable feeling deep down when you make a choice you don't truly believe in. So, I thought it would be helpful to offer you some tips, tricks, and techniques for learning to listen to your own beautiful wisdom, trust your truth, and in turn, make decisions you will be proud of in the long run. I know that meditation isn't for everyone, but for me, it has become a welcome escape to clarity and understanding. If I am particularly struggling with a decision or something that has come up in my life, I often take time to sit and meditate on it. This can look very different for everyone. It doesn't necessarily mean sitting and only thinking about the topic at hand, but simply clearing your mind to welcome your subconscious truths to come through and give you some much appreciated insight. Whether I realize it or not, I'll often come out of mediation with a next step or a sense of clarity in decision that I didn't have before. There are LOADS of guided meditations on YouTube to help you manifest or decide upon any number of important life decisions or simply to find some clarity. I encourage you to search and try one out. Like I said, hindsight is 20/20, and sometimes all it takes to hear your gut instincts loud and clear is viewing things from the perspective of already having made the decision. Sit down with a pen and paper and tell yourself you have already chosen one of your options and have committed to it 100%. Sit with that knowledge for a few minutes and write down some of the emotions you are feeling or words/ideas that come to mind. Then, do the same with the other option(s) available to you. Decide. Commit. Sit with it. And then write down how you feel and what that decision means to you and your life. By doing this, sometimes the best, most truthful and wise decision becomes outrageously clear when you listen to how each choice makes you feel from an "already done" perspective. Many of us let our emotions and thoughts become jumbled, messy knots of indecision in our minds. I know I am often guilty of this. I will think through something so extensively that it will take all of my headspace and I'll still have no idea what to conclude. Take time to sit down with someone you trust; someone who knows you really well. If you can't sit down, give them a call and let them know you want a little time to talk something out. Tell them all about the choice. Tell them all your thoughts about it, all the emotions you are feeling, and all the worries you have. As you explain things, it is sometimes clearer to see things from a big-picture perspective and know in you heart what the answer is. If it is still not clear as you are explaining, the person you love and trust will often reflect the answer they know you know deep down, but that you haven't been wiling to accept yourself quite yet. It is eye opening and extremely freeing to share. This is a classic strategy that we've all heard of, but it is sometimes highly underestimated. I've made countless big decisions using a simple pros and cons list. Whether we like to admit it or not, we often sway our choices based on fear or emotions that aren't true to us. 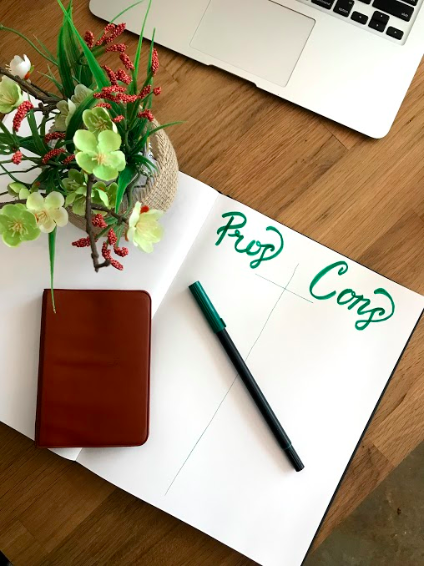 I can't tell you how many times I've made a pros and cons list and been entirely surprised by how many more cons there were than pros. I had no idea the choice was so easy, it was simply jumbled within my head. Sit down with a piece of paper and pen and make a T chart; one side Pros, one side Cons. Then, sit and really think about the options you have. How will they effect you in the future, how do they make you feel emotionally, how will they effect those you care about, what does or does not align with your values? Consider all of this and more and be sure to write down everything you think of on the list. Sometimes, it is best to take a few days to continue adding to it as you think of either pros or cons. Then evaluate the list...I'd be willing to bet your decisions is much clearer now. Anxiety, fear, anger, anticipation, excitement, joy, and all other emotions manifest themselves differently in all individuals. For example, I feel anxiety as a pressure sensation right under my breastbone while my partner feels anxiety by his hands getting cold. Part of learning to go with your gut, listen to your wisdom, and trust your truth is learning what YOUR tells are. If you have made a decision in the past that didn't turn out to good, can you recall any feelings of knowing it was the wrong decision when making it, but doing it anyway? When I've made poor decisions and ignored my gut, it has usually been for financial gain and I have known deep down in my belly that it was the wrong choice. What is your tell? Do you feel anxiety? Do you get a headache? Do you fidget with your hands? If you pay close enough attention, you will soon learn how to use your body as a language for decision making. And you can enjoy those GOOD decision feelings of joy and contentment more often. You know what? You are going to fail sometimes. We all do, it is part of life. But the perk of failing is that you learn. And failing gratefully is learning gracefully. If you make a not so good decision, learn from that experience so you can make a better decision next time. The more you know about yourself and the more you listen to your inner wisdom, the happier and more purposeful your life will feel. Purpose essentially IS trusting your truth and going after it with great enthusiasm. Learn to go with your gut and live with gusto! The more you choose what feels good, the more in line you are with who you are meant to be and the wonderful things that are in store for you. I truly hope these tips will help you along the journey of life. It isn't always easy, but if you learn to tune in to yourself, you can create a purposeful, passionate, fulfilled life that you are proud and excited to live each day. And that is the most glorious gift of all.